Fancy footwear is ideal to be worn for complete comfort and style. They add spice to closet and make the wearer stand apart in the crowd due to his or her grace. Wearing jute fancy footwear is a memorable experience for the user. Fancy jute footwear designed from jute is a perfect means to enhance the personality with elegance. They are manufactured from the natural material, jute that is known in the market for stringy, sturdiness and other highly valued features. Fancy jute footwear made from this natural material is featured with high durability and sturdy characteristics. Fancy jute footwear are 100% biodegradable in nature that ensures no harm to environment while decomposed. 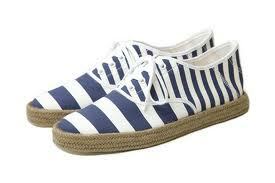 They are fun to wear especially in the summer season. This highly comfortable and trendy footwear can be easily worn with any kind of apparel. They add starts to the persona of the wearer in any informal party, marriage and other occasion. The sole of the fancy footwear is designed from jute as well as jute blended with other material like rubber, leather, etc. The upper portions of the footwear are manufactured from jute, hence they are environment-friendly. There are different types of fancy jute footwear available in this collection. The range includes flats, wedges, and platforms. The slip-in version of the footwear is in huge demand. The ankle-strap is also another good option of fancy jute footwear of jute for young women. These eco-friendly shoes keep the feet odour as well as sweat free all day long. Jute used in the production allows proper air circulation so that the feet of the user remain clean and fresh for the whole day. Even the fancy jute footwear can be easily cleaned and washed. They can be easily availed at reasonable prices without burning a hole into the pocket.